is multidisciplinary biomedical journal published quarterly by the First Faculty of Medicine of Charles University in Prague. Prague Medical Report was founded as Sborník lékařský in May 1885. From 2004 is a fully reviewed scientific journal in English. Our journal has got brand new website. The journal „Sborník lékařský“ represents a journal with long and respectable tradition for the First Faculty of Medicine. Through the years it underwent many contentual, organisational and also cosmetic changes. However, its present development cannot be over sighted. 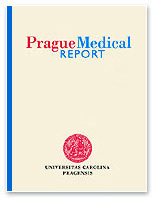 Primarily, the name of journal is changed for “Prague Medical Report”. It reflexes to the conceptual change to a fully standard, reviewed, scientific journal published in English. Our ultimate goal is only a wish at present, but it could be fulfilled in future. The principal task is to build a scientific prestige of the journal to be evaluated with Impact Factor. Only such journal can claim its existence and could serve to the rising number of post gradual students of our faculty. Achieving it does not depend on the editorial board only; such goal requires optimal publishing strategy and namely excellent authors and papers. If publications are cited, including mutual citations, the impact will growth and our goal will approach. The international acknowledgement and the impact factor would benefit from publishing papers done in collaboration with prestigious laboratories, clinics and institutes. The front cover and overall arrangement of the journal will be substantially changed. New is the editorial board and editors. At the same time the general specialisation will remain: journal will publish primary scientific publications, short communications, casuistry, and reviews. It will contain articles based on eminent specialised lectures and symposia. Also articles on the history are welcome, namely those dealing with the past and present activities at our faculty. We expect that the long intervals for publishing individual papers will be shortened. All the communication will be only electronic and both the authors and editors should respect the time allowance for revision. Let us hope that all suggested changes would be accomplished and the “Prague Medical Report” will serve to the benefits of our academic community. Prof. Miloš Langmeier, M.D., D.Sc. Are Serum Procalcitonin and Interleukin-1 Beta Suitable Markers for Diagnosis of Acute Pyelonephritis in Children? How Smoking Cessation Influence Hormonal Levels in Postmenopausal Women? Acalculous Cholecystitis or Biliary Dyskinesia for Epstein-Barr Virus Gallbladder Involvement? © 2004 - 2019 Prague Medial Report. All rights reserved.